5- I Know A Place / The Israelites / Roots / JumpUp! WAPJ will once again be providing comprehensive coverage of local, state and national elections on Election Day, November 4th. We'll begin with Michael Cohen and guests who will provide commentary from a teen perspective starting at 5:00PM. Anchorman Larry Wright (host of "Air It Out"), along with his sidekick Scotty, will follow with plenty of additional commentary, tracking of trends and reporting of results as it all unfolds. Former Torrington mayor Mary Jane Gryniuk and former city councilman Thomas Scoville are tentatively scheduled to join in to share their insights as well. In addition, WAPJ field reporters will provide accurate results directly from local polling places. So, let your friends know WAPJ is the place to tune in for full 2008 Election coverage. 7- Seed Grow / Asherman Meets Dub Street Rockers / Zion Ready / JumpUp! Bob DeVito, host of "Footlights and Spotlights" is proud to announce he's producing a radio drama to air live on Saturday, Oct 11, 2008. The radio drama is called "Pain on Deep Inspiration"; the script was written by local playwright, Sean Alan Morris. Tune in live on Saturday, Oct 11, 2008 from 4pm to 6pm for this debut performance. 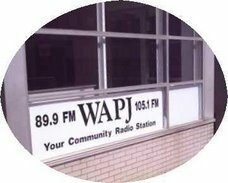 How Much Power Does WAPJ Have Compared to Other Stations? WAPJ operates with 40 watts of Effective Radiated Power on 89.9 and with 20 watts of ERP on 105.1. This isn’t much power when compared to say Litchfield’s WZBG which has 6,000 watts but we have done everything we can to maximize the coverage. This includes using a state of the art transmitter and antenna and locating the 89.9 FM antenna on Highland Avenue, one of the highest spots in town since FM is a line of site medium and height is everything. Can you increase your power and/or Coverage? 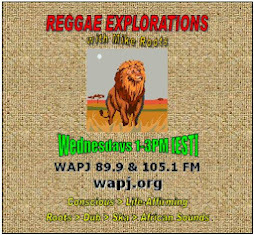 Unfortunately, since WAPJ was licensed decades later than most of the other FM stations in the state, we are not able to increase the power of our 89.9 signal or move to a better frequency. The FCC rules are based on 1960s receiver technology and radios of that era had trouble separating one station from another. It is for this reason that the FCC has very specific standards for separating stations . . . they basically “protect” each station for three channels on either side of its frequency. Using Hartford as an example, there are local or semi-local stations on 88.1, 88.5, 88.9, 89.3, 89.9, 90.5, 91.3, 91.7, 92.5, 93.1, 93.7, etc. This spacing continues all the way to the top of the FM dial with stations on 105.9, 106.9 and 107.7. There are two other stations in CT on 89.9 that we must protect (since they were there first) along with nearly a dozen stations on our adjacent channels, 89.5, 89.7, 90.1 and 90.3. In fact the Commission requires some protection to stations 3 channels away which brings the number of stations we need to consider up to about two dozen and with the FCC it is first come, first served when it comes to protection. It is for this reason that we applied for and received a license for another frequency, 105.1 back in 2003. While the 105.1 frequency is currently operating at 20 watts we will soon be applying for permission to increase the power up to 100 watts. This is a complicated process and again we have to consider stations in the area from 104.5 through 105.7, including another 105.1 in Great Barrington. If these protection rules seem ridiculous, they are. Most modern radios can separate stations as close as two channels but it is highly unlikely that the Commission will ever change them due to pressure from the National Association of Broadcasters whose members simply do not want more competition. 4- Wars, Rumors Of War / JD Smooth & Friends feat. Roman Stewart / An Inspirational Journey / Wearl "G"